The worldwide protests expressing solidarity with the Greek people ahead of Sunday’s referendum on a cash-for-reform deal with its Troika of creditors, have all been gathered in Ruptly’s interactive map. From Melbourne, Australia, where demonstrators called for maximum unity and solidarity with the people of Greece, the map moves to European cities, such as Berlin, Brussels and London, which urged Greece to vote “No” in the upcoming referendum. 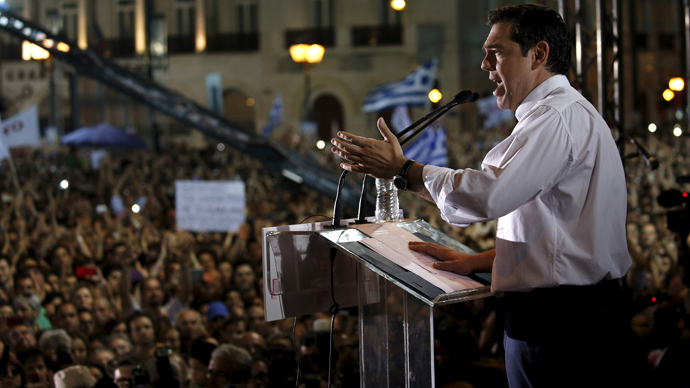 Greece was supposed to make an IMF loan payment of €1.6 billion by June 30, but failed. Now the country is required to make another major payment of €3.5 billion to the ECB by July 20. After the talks between Athens and the Troika failed, Greece’s left-wing government announced the country would hold a referendum on July 5 on the Eurogroup’s latest austerity plan. If Greeks vote “Yes,” the current government is likely to resign and the people will have to accept the harsh austerity measures demanded by the Troika, including additional wage and pension cuts. However, if Greeks vote “No,” this could lead to Greece’s exit from the Eurozone and potentially the EU.